Logos the property of D Magazine and Lakewood Brewing Company, respectively. Over the last few days, one of the hot topics on social media has been the latest installment of something called "Taste Test Thursday", a weekly review-like column put out by D Magazine. It focuses on various foods and beverages found locally and, naturally, every so often they round up a number of beers and give them the once over. In the past, subjects covered have included Dallas IPAs, holiday beers, pumpkin beers and what some might consider to be off-the-wall offerings. This week the topic was session IPAs, and low and behold Lakewood Brewing Company took them to task for something that was said. Certain there must have been some sort of misunderstanding, I decided to peruse some past articles to try and understand their process. And, I'll tell you, for the life of me I can't understand why everyone is so upset. To begin with, they go out of their way to publish the opinions of fair and impartial jurors. Not only that, they obviously take great care to ensure that they sample the products in the proper order while pausing to cleanse their palates after each beer. Oh, and they always use appropriate glassware. Furthermore, those selected for the panels are all highly-qualified experts, each well-versed in the finer points of the styles they've been chosen to judge. Comments such as these being a clear indication that the BJCP needs to do a comprehensive update of the American IPA style guidelines. I mean, the excerpts that follow must surely be incorrect. Appearance: "Should be clear, although unfiltered dry-hopped versions may be a bit hazy." hop character, such as citrus, floral, pine, resinous, spicy, tropical fruit, stone fruit, berry, melon, etc." As for brewers, I can't imagine that they don't appreciate the criticism offered, since it's constructive and written in complete, coherent sentences. Plus, they can gain valuable insight into the impact of any specialty ingredients used in the creation of a recipe from tasting notes that are often powerfully evocative. Indeed, given all of that, it's quite apparent that the opinions of D Magazine staffers are ones to be valued when it comes to the objective, informed and unbiased evaluation of craft beer. I, for one, plan to tune in each and every week to further my own beer-drinking education. Ten years of BJCP certification be damned! In the meantime, though, one pearl of wisdom from above has inspired me to go out and scour the shelves in search of a bottle of Undead Party Crasher from Clown Shoes. Why, you ask? Because nothing says nom nom nom like a nut skin nose. In June, it was revealed that Deep Ellum Brewing Company was among five American breweries chosen to participate in Drinking Buddies, a craft beer collaboration effort spearheaded by Jameson Irish Whiskey. As part of the program, each brewery was invited to visit the distillery in Ireland, after which they were provided with fresh Jameson barrels to use in the creation of an inspired barrel-aged beer. 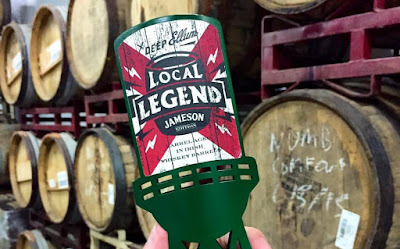 For Deep Ellum, the result of this partnership is Local Legend - Jameson Edition, which was introduced to the public for the first time at a private event held at the brewery on Tuesday evening. The project represented a unique opportunity for all those involved, according to Patrick Caulfield, senior brand manager for Jameson's parent company Pernod Ricard USA. That, he says, is due to the fact that "aging any kind of beer in Jameson whiskey barrels is something that's never been done before in the United States." One of the reasons, he explains, is because "it's really hard to get whiskey barrels from Ireland due to a whiskey shortage" and there's simply not enough supply to meet demand. To that end, Jameson earmarked only thirty barrels to the Drinking Buddies initiative, with six going to each of the five brewery partners. Considering how precious the barrels were, it's no surprise to hear Caulfield say that "choosing the right partners was a big thing." It was a process that started out by focusing on breweries in Jameson's best performing markets. Beyond that, it was about identifying breweries that shared certain characteristics with the distillery and its surrounding community. Naturally, the breweries had to have a passion for their craft and be committed to doing things the right way, but equally important was a connection to their hometown neighborhood and the support of local bartenders serving their product on a daily basis. Judging with those criteria, Jameson determined that Deep Ellum was the right fit for Dallas. Event photos courtesy of Ketchum (click to enlarge). As for the making of Local Legend, it's a barrel-aged version of Deep Ellum's Legendairy milk stout, something which includes a touch of local flavor in the form of roasted Texas pecans. The base beer spent a little more than three months in the Jameson casks, after which it was blended with a fresh batch of Legendairy and tweaked a bit to give it additional chocolate flavor. That element comes across somewhat prominently when drinking the beer, as do the pecans, with the barrel components contributing light tannins and a fair amount of warmth to the finish. Asked for his thoughts on the finished product, Deep Ellum founder John Reardon said, "We believe we have come up with a pretty fantastic beer. Of course, none of this would have been possible without the Jameson barrels. That's really what's important. They added an element...a certain something...that we just couldn't create on our own." Caulfield agrees in saying that "the end product is really good," a seemingly fitting end to what he calls a rewarding journey for himself personally and for the brand. "To get here and to actually have a product to be able to drink, taste, smell, experience and to see the characteristics of the whiskey come through has been really exciting." Regarding availability, based on the number of barrels used in this batch, it should be noted that quantities of Local Legend - Jameson Edition are extremely limited. For comparison, only two barrels were used in making Barrel-Aged Four Swords, which debuted in Deep Ellum's taproom prior to its release in bottles. Local Legend - Jameson Edition will not be packaged, but it will be offered in the taproom as well as at select draft accounts soon. Image credits: FullClip Craft Distributors, Texas Ale Project. 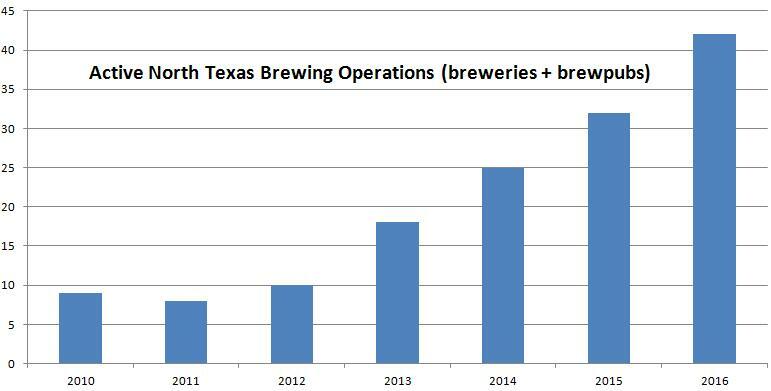 Bringing together two relative newcomers to the North Texas beer scene, the Texas Ale Project (T.A.P.) has entered into an agreement with FullClip Craft Distributors to deliver its products to the greater Dallas-Fort Worth area. Despite having yet to celebrate its first anniversary, Texas Ale Project has quickly built its reputation around a stable of year-round offerings which includes Fire Ant Funeral, 50 FT Jackrabbit IPA, Naked Truth and Somethin' Shady Porter. As for FullClip, the company began operations in September of last year, when they started selling and distributing for Community Beer Company. Since then, they've gone on to add Guns & Oil Brewing of Austin, Texas and Backcountry Brewery of Frisco, Colorado to their developing craft portfolio. FullClip General Manager Joey Marzuola concurred, adding "There's a new demand for a passionate, knowledgeable sales and distribution team like ours in the North Texas market - one that's dedicated exclusively to the needs of craft breweries like Texas Ale Project and others we are partnering with." According to a press release, while FullClip will work to expand the availability of T.A.P. beers throughout Collin, Tarrant and Denton County, the brewery will continue to self-distribute in Dallas County for the foreseeable future.